After a surge of live-action films based on big-name animated franchises last year, 2015 has been fairly quiet on that front, with the upcoming Attack on Titan being one of the few projects that really seems to have fans of the original version excited. On the other hand, there’s been a boom in stage adaptations of popular anime. We already knew that we’d be getting live stage shows based on Naruto, Fushigi Yugi, and One Piece. Now, lovers of theatre and anime alike have one more performance to look forward to, the stage version of volleyball hit Haikyu!! Weekly Shonen Jump, the manga anthology Hikyuu!! is serialized in, recently gave a bit of extra recognition to creator Haruichi Furudate’s sports story by featuring the cast on its cover, celebrating the comic reaching the three-year mark. It also published the first few pages of the most recent chapter in color, an honor commonly given to manga when they hit important milestones. Even before the special issue, it was shaping up to be a good year for Haikyuu!! Six months after its first batch of 25 anime episodes finished airing, interest in the series remains strong, and its sizeable fanbase is anxiously awaiting the start of its new season in October. That’s not all fans have got to look forward to, though, because announced in the pages of Weekly Shonen Jump is something called the Haikyuu!! Hyper Projection Stage Performance. The magazine describes the show as “a hybrid of manga, stage acting, and visual images.” Casting has yet to be announced, as have ticket prices and exact performance dates. Weekly Shonen Jump did reveal, however, that the stage show is scheduled for November and December of this year, and will be held at venues in Tokyo, Osaka, and Miyagi. Both Tokyo and Osaka are obvious choices, what with Tokyo being the most populous city in Japan and Osaka the largest in the central Kansai region. Those not familiar with Haikyu! !, though, may be puzzled by the inclusion of Miyagi, a prefecture in northeastern Japan. Miyagi is where you’ll find Sendai, the biggest city in the Tohoku region. Still, even Sendai has fewer residents, and thus represents a smaller market, than Kyoto, Nagoya, Kobe, or Fukuoka. So why are the producers passing up those larger, potentially more lucrative cities for Miyagi? Because Miyagi also serves as the setting for Karasuno High, the fictional school attended by Haikyu!! 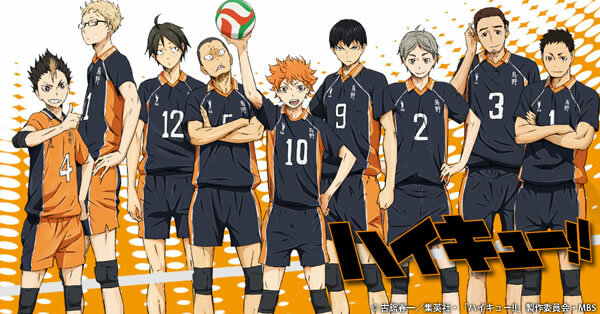 protagonist Hinata and his volleyball teammates. After all, in the world of sports, it’s always nice to have the home-court advantage.